The Cascade Range is one of the great mountain ranges of North America. It stretches from southernmost British Columbia in Canada to just south of Lassen Peak in California. Populated with spectacular, glacier-clad volcanoes, vast forests, plunging waterfalls, and vast expanses of wilderness, the Cascades are one of the great mountain ranges of the American West. While it is natural to think of the states of Oregon and Washington when considering the Cascade Range, it would be an unfortunate mistake to omit the portion of the Cascades that extend southward into California. When describing the Cascade Range, it is common for most people to envision the black lava fields and expansive forests of Oregon and the deep river valleys and rugged mountains of Washington. The lush Columbia River Gorge and the volcanic wasteland around Mount St. Helens go hand in hand with the icy towers of Mount Rainier and Mount Hood. Yet, while these are deservedly iconic images, it is an incomplete image of the mountain range as a whole. The southernmost portion extends over 130 miles into California. This part of the Cascade Range includes the second and third highest summits in the range as well as some of the most recent and dramatic volcanic activity. Like the Cascades further to the north, the area is defined by towering, glacier-laden volcanoes, vast forests, dark lava flows and wild rivers. The California Cascades can be broken up into two major sections. At the southernmost end of the range is the Lassen Cascade, centered on Lassen Peak and Lassen Volcanic National Park. North of this area is the Shasta Cascade, which is naturally dominated by magnificent Mount Shasta. However, the mountain is only a significant part of a larger volcanic complex, much of which is underappreciated. Running between these two regions is the Pit River, which conveniently divides the Cascades in California. One of the largest rivers in Northern California, the Pit passes through the heart of the California Cascades. Its passage through the mountains does not receive much fanfare but it is noteworthy for several reasons. Chief among them is the fact that it is unusual for a river to rise on one side of a mountain range and then carve a path through the heart of the range, rather than flowing around. For example, no river begins on the east side of the Sierra Nevada and manages to find its way to the Pacific. Instead, the eastern rivers all flow into the Great Basin and evaporate in large sinks. The Pit River manages to buck this trend and carve through the Cascades in order to link up with the Sacramento River. Interestingly, the Pit’s journey through the Cascades is the southernmost of three such occurrences. Just to the north the Klamath River accomplishes a similar feat near the Oregon border. The most dramatic example of this is the Columbia River’s passage through the Columbia River Gorge. This is essentially a sea level pass through a major mountain range, something almost unheard anywhere else. While the Pit River’s bisection of the California Cascades is not nearly as spectacular as the Columbia’s, it is not without its own scenic beauty. More importantly, it marks the border between to the two major zones in the California Cascades: the Shasta Cascades and the Lassen Cascades. To the north of the Pit, most of the major geologic features are related to Mount Shasta and the creeks and rivers are part of the Sacramento River and Klamath River watersheds. 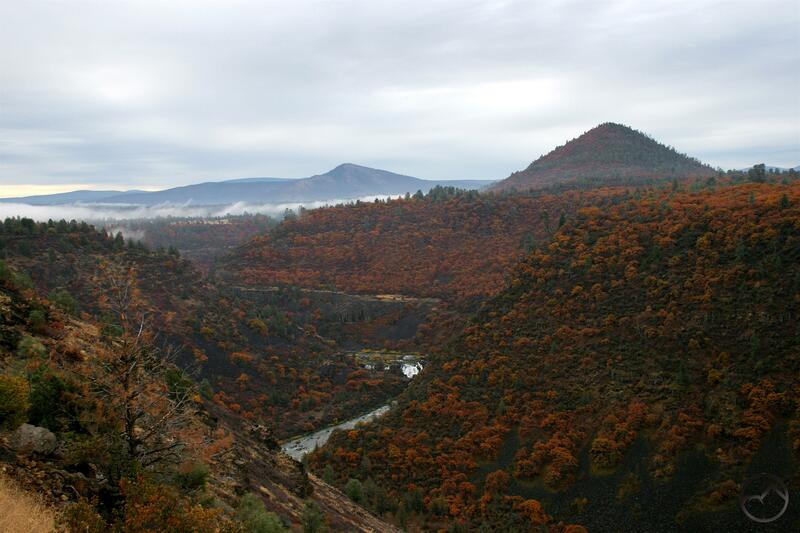 South of the Pit River, the geology is oriented toward the remains of Mount Tehama and the rivers and creeks flow into the Pit River and Feather River watersheds. The division of the California Cascades by the Pit River makes a convenient distinction between the Cascade’s two major regions in California. In addition to dividing the California Cascades into two primary areas, the Pit River area, which is also referred to as the Intermountain Area, is also a very scenic area in its own right and filled with numerous recreational opportunities. 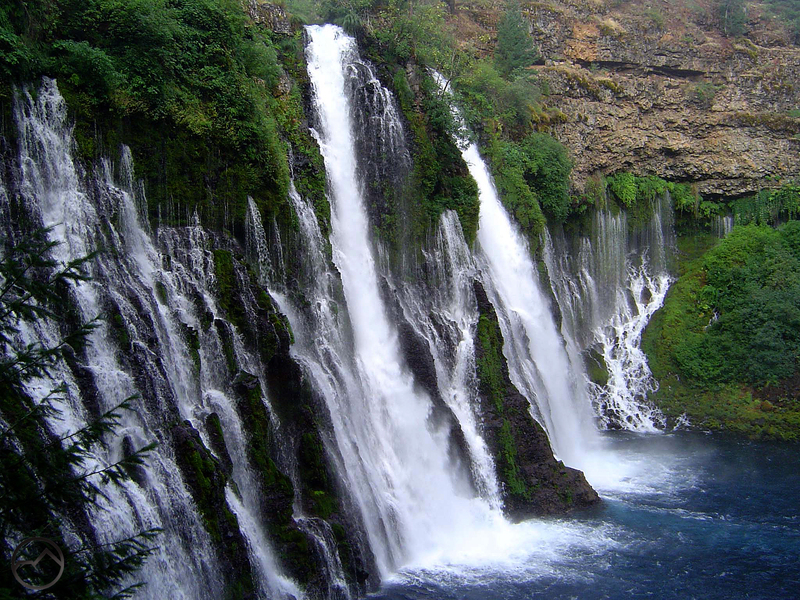 The most popular spot is gorgeous Burney Falls, one of the most unique and spectacular waterfalls in California. Nearby Lake Britton is a significant impoundment of the Pit, which facilitates a substantial hydroelectric operation. The lake also offers numerous aquatic activities. Upstream from Lake Britton is the Pit River Canyon, where the river cuts a deep gorge through the heart of the Cascade Range. The volcanic history of the region is evident in the layers of lava flows that are revealed where the river has eroded away its impressive channel. The layered appearance is reminiscent of the canyons of the Palouse and the numerous cut lava canyons of southern Idaho. The highlight of the canyon is awesome Pit River Falls, a easily viewed cataract that deserves more renown that it receives. Even further upstream, more volcanic features are visible just north of the Pit River at Ahjumawi Lava Springs. Fascinating remnants of Native American culture can also be found in this remote and wild area. South of the Pit River is the southernmost extension of the Cascade Range. 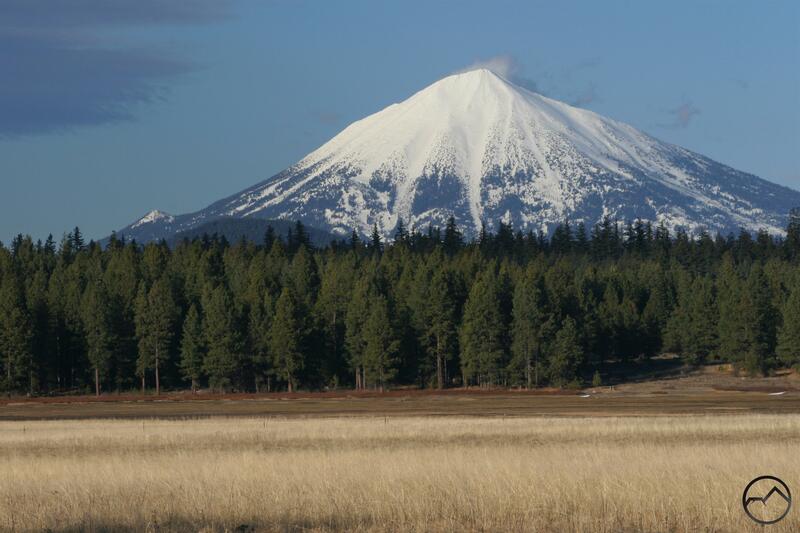 The high point of the area, both figuratively and literally, is the ruined remains of prehistoric Mount Tehama, crowned by the rugged heights of Lassen Peak. Mount Tehama once rose to icy heights in this area much like Mount Shasta. However, massive eruptions obliterated the mountain long before people arrived in the area. Remnants of the old stratovolcano now form some of the tallest mountains in the California Cascades. Lassen Peak itself is a plug dome volcano that has pushed up over the old eruption point, much like Wizard Island in Crater Lake and the cone that continues to grow inside Mount St. Helens’ crater. The Lassen Peak area rises just north of Lake Almanor. The valley occupied by this lake constitutes the dividing line between the southern end of the Cascade Range and the mighty Sierra Nevada, which stretches 400 miles to the south. 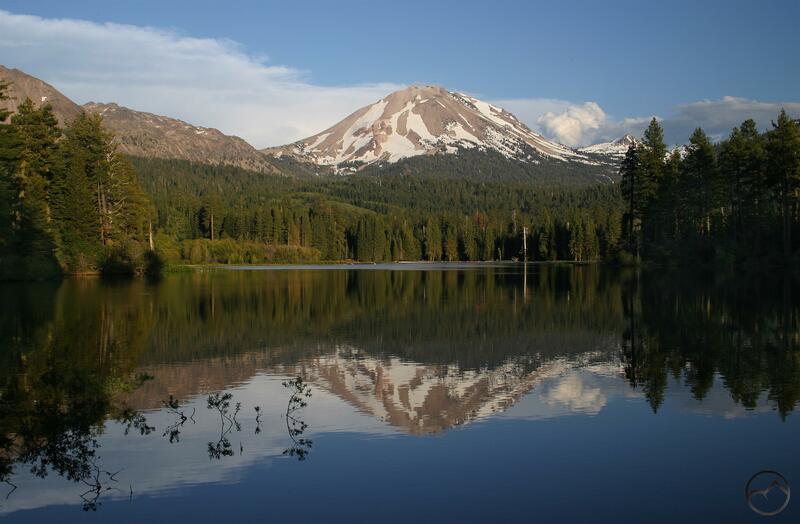 The heart of the Lassen Peak area is encompassed in Lassen Volcanic National Park. This area is covered in vast expanses of virgin timber and dotted with numerous beautiful glacial lakes. The centerpiece of the park is Lassen Peak itself. At 10,457 the mountain is the second highest mountain in the California Cascades and the southern most major volcano in the entire Cascade Range. The peak erupted continuously for many years early in the 20th century that included a major eruption in May of 1915. Geothermal activity continues at numerous sites scattered around the base of Lassen Peak and other parts of the ruins of Mount Tehama. 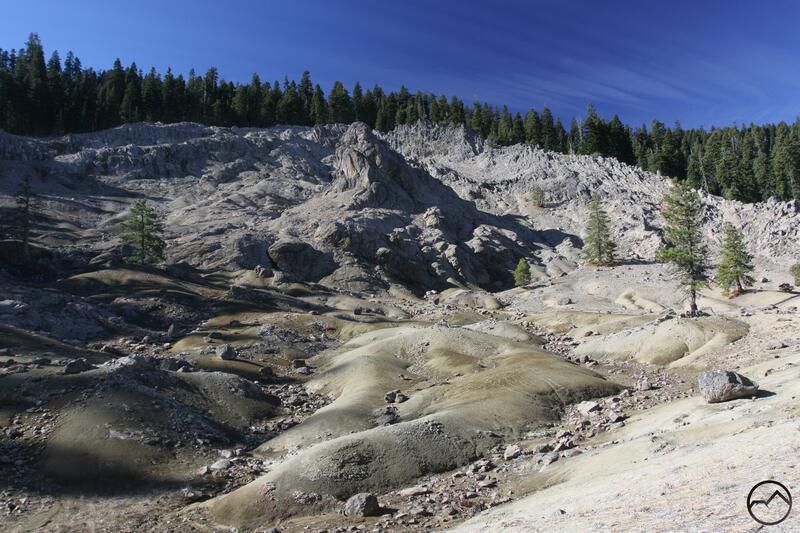 Lassen Volcanic National Park is a fantastic hiking destination. Trails crisscross the 106,452 acre park. In addition to exploring the geothermal features, the trails lead to crystalline lakes, beautiful waterfalls, lush meadows and alongside clear, swift-running creeks. The west side of the park is the most mountainous and is centered on the remnants of Mount Tehama. The central portion of the park features more subdued terrain, vast virgin forests and scattered lakes. 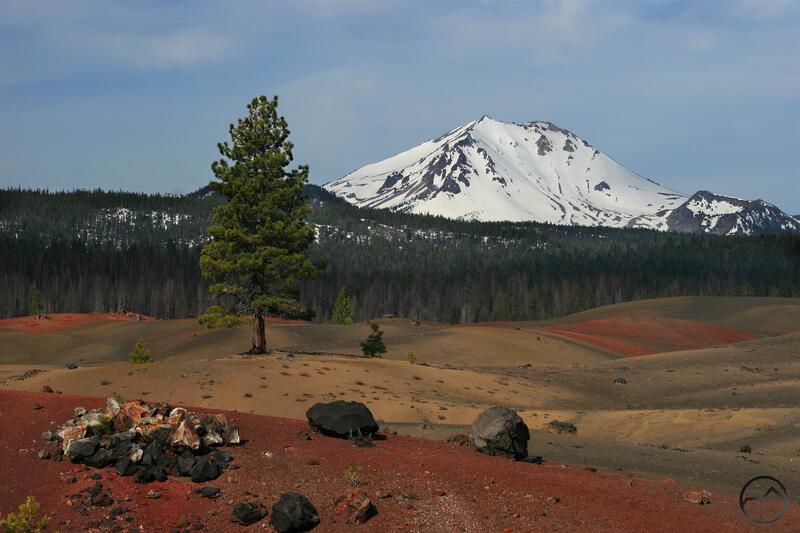 The far eastern end of the park features more volcanic peaks as well as cinder cones, lava flows, pumice dunes and a series of extremely large lakes. About 70% of the park is wilderness, meaning that these features are all preserved in their primeval state, ready for hikers and backpackers to enjoy. Immediately east of Lassen Volcanic National Park lies a broad, heavily wooded plateau, much of which is contained in the 20,546 acre Caribou Wilderness. This area contains numerous lakes as well as high volcanic cones. Like the national park, this area is accessed by numerous intersecting trails and is a great destination for hikers. Further east the Cascade Range consists of a series large shield volcanoes of modest elevation. Between these peaks lie wide, grass covered valleys. Marking the eastern boundary of the Lassen Cascade is large Eagle Lake. Within a closed basin, the lake has no outline and is alkaline. Nonetheless, it is the second largest natural lake entirely within California. The endemic Eagle Lake trout has adapted to survive the high alkalinity of the water. 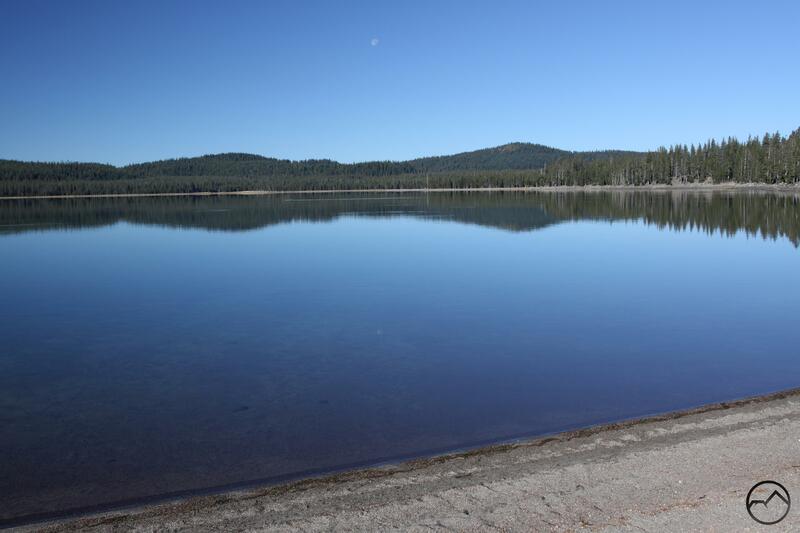 The area around the lake exhibits a greater degree of aridity than the higher parts of the Lassen region, indicative of decreased rainfall as the climate transitions to the dry Great Basin Desert. The lands to the west of Lassen Volcanic National Park are quite different from those on the east side. The mountains fall away fairly swiftly to a series of large plateaus that are cut by deep canyons. Large creeks fed by the abundant snowfall of the Lassen area charge through the gorges. This is a remote, rarely traveled place. It was here where Ishi, the last known Native American living independently of the modern world. 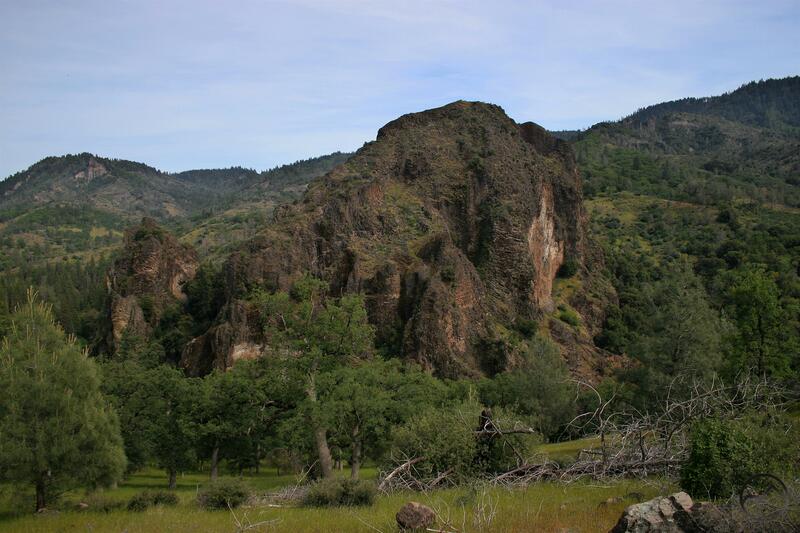 Today this area is preserved in the fantastic 41,339 acre Ishi Wilderness. This seldom-traveled, wild land is a fantastic escape for hikers and backpackers who want a spectacular, low-elevation adventure in the winter or spring. Indeed, with its roaring creeks, green fields and awesome wildflowers, spring is a paradise here. North of Lassen Peak, the land is dominated by the long Hat Creek Valley. Hat Creek begins on the flanks of Lassen Peak and flows north, into a its namesake valley. 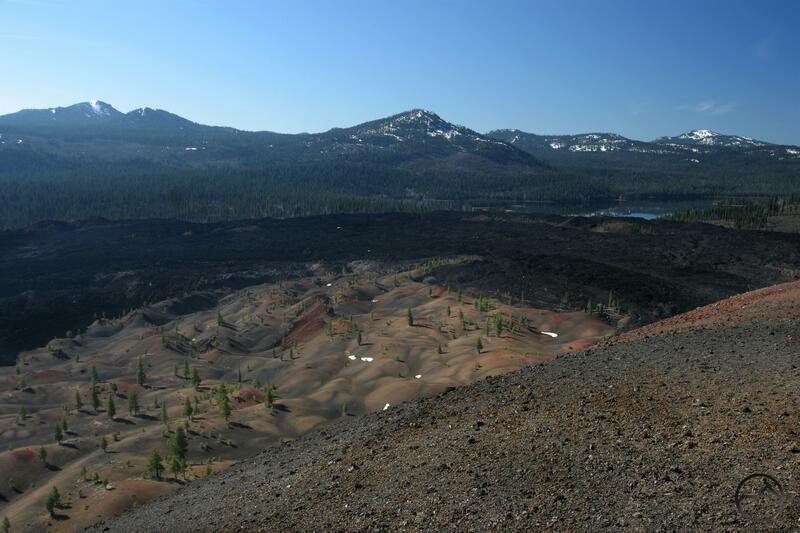 Here there are numerous volcanic features including lava flows, lava tubes and cinder cones. Though this area has recently been ravaged by fire, it remains a beautiful destination for hikers and anglers. Towering above the west side of Hat Creek Valley is the crest of the Cascade Range. It extends north, toward the Pit River. 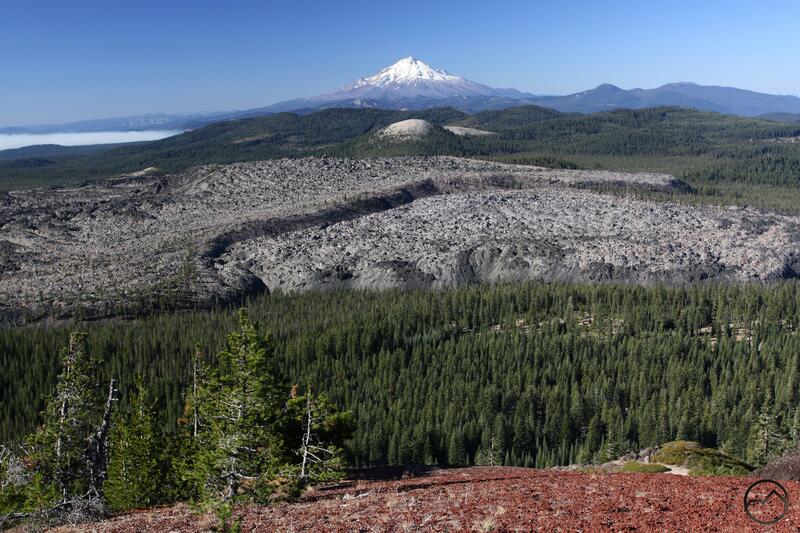 Here are found other major, volcanic peaks, particularly the remnants of the Thousand Lakes Volcano and Burney Mountain. The former, protected as part of the 16,335 acres Thousand Lakes Wilderness. This slice of alpine heaven is classic Cascade terrain, with a towering, crater capped volcano, lava flows, secondary volcanic peaks, cinder cones, virgin forests and glacial lakes. 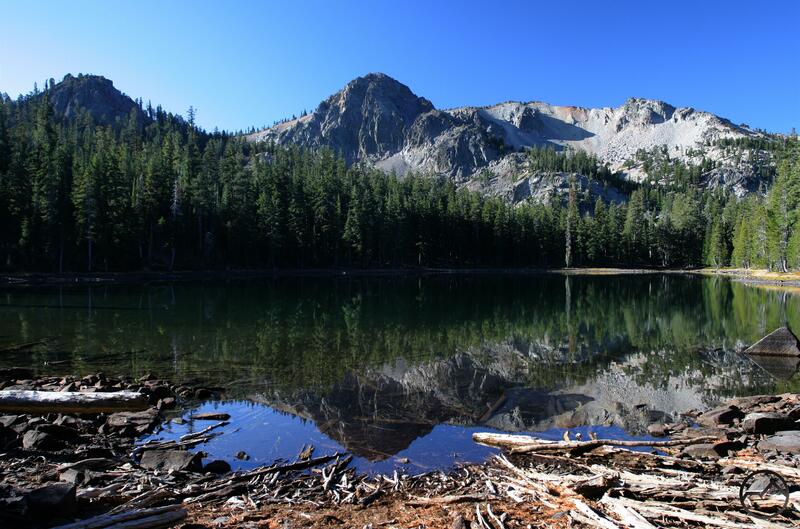 While there may not be one thousand lakes in the Thousand Lakes Wilderness, there are still a few gems worth visiting, especially awesome Everett and Magee Lakes. These are two of the finest lakes to be found in the Lassen Cascade. To the north of the Pit River is the Shasta Cascade. Though the region takes its name from its most obvious and dominant landmark, the geomorphology of the region is much more ambiguous than that of the Lassen Cascade. 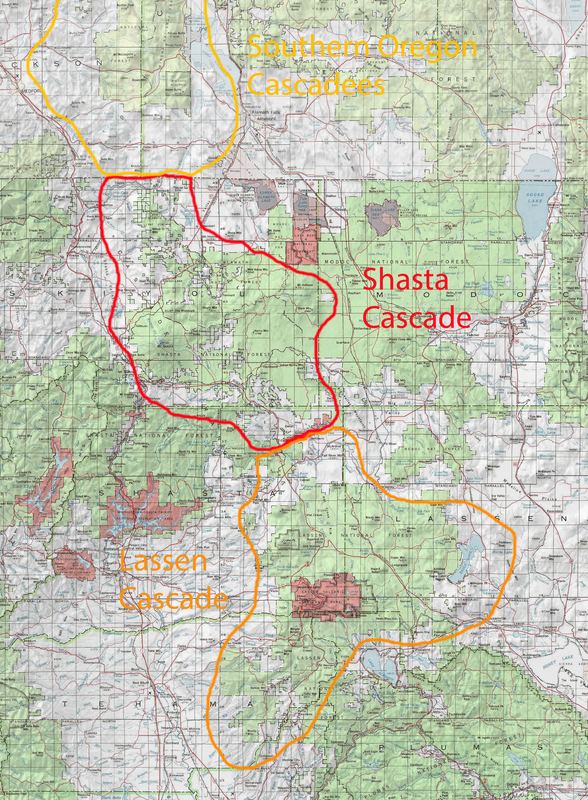 The obvious crest of the Cascades exhibited in the Lassen area is much more subdued north of the Pit. Indeed, the area seems pulled between two massive poles. At the far west lies mighty Mount Shasta. Vying for supremacy with the ice-clad giant is the massive Medicine Lake Caldera. While its size is not readily apparent, it remains the largest volcanic feature in the entire Cascade Range, along with the equally massive Newberry Caldera near Bend, Oregon. Between these two fiery behemoths, lies a seemingly unending collection of smaller volcanic peaks blanketed by vast forests. Despite the decentralized nature of the Shasta Cascade, it does the single crest does manage to reemerge at Ash Creek Butte and extend northward along a narrow line of high peaks toward the Klamath River and the Oregon border, where the California Cascades come to an end. Despite being the obvious focus of the California Cascades, Mount Shasta is actually an outlier on the far western edge of the range. Rising thousands of feet above the surrounding landscape, it is the most dominant and commanding mountain in all of California. Mount Shasta is so large, it almost seems like a mountain range unto itself. It is home to numerous secondary peaks and rock formations including the staggering sub-peak Shastina, which is the third highest summit in the Cascade Range. 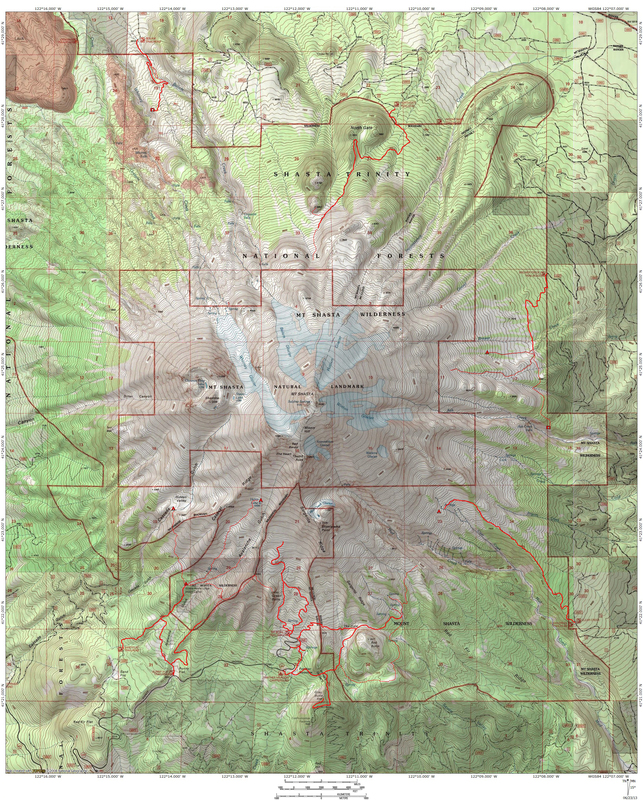 Other major peaks include Thumb Rock, Shastarama Point, Green Butte, Red Butte, Gray Butte and the North Gate Plugs. 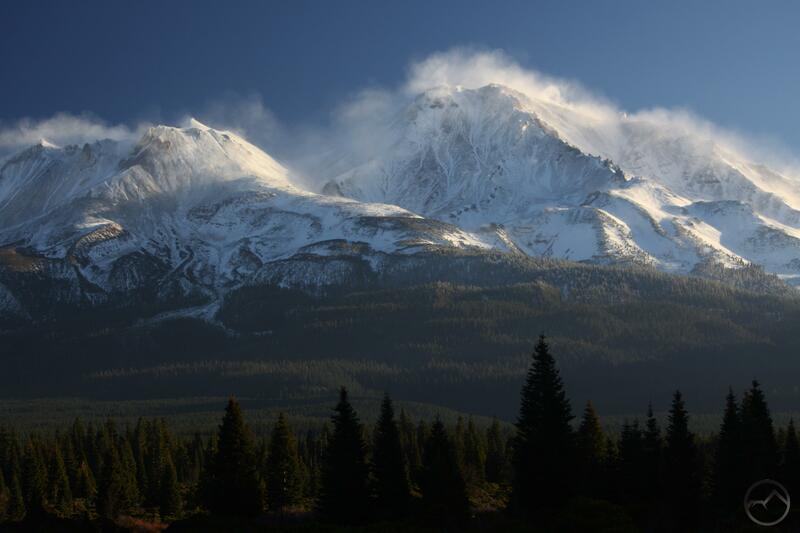 Mount Shasta is also home to California’s largest glaciers. The mountain is home to some of the most spectacular hiking trails in California. These explore the vast, wild flanks of the mountain near timberline and lead hikers to verdant meadows, magnificent waterfalls, awesome canyons and unparalleled views. To the east of Mount Shasta are the Medicine Lake Highlands, which compose the large Medicine Lake Caldera. This giant volcano is now silenced and its yawning crater is home to serene Medicine Lake. While the volcanic activity in the crater has ceased, the fiery origins of the highlands are revealed in the extensive lava flows that surround the lake. Chief among these flows is stupendous Glass Mountain and Little Glass Mountain. These lava flows produced vast amounts of obsidian. The Medicine Lake area has also attracted the geothermal industry. Though no power plants have been built, the volcanic conditions make the area suitable for large scale electrical generation. Wells have been drilled to test steam production but the future of geothermal power generation in this area remains uncertain. This leaves the area free to be a haven for campers and anglers. There are only a few developed hiking trails in this area, notably around the north shore of Medicine Lake and along nearby lava flows. It should be noted that for the purposes of this taxonomy, the Lava Beds area, which lies north of Medicine Lake, has been categorized as part of the Modoc Plateau/Klamath Basin and will not be examined here. South of Medicine Lake and Mount Shasta are the McCloud Flats. This vast, relatively level area is smothered in forest. While it lacks significant topography, it is especially notable for the passage of the McCloud River along its southern border. The river is one of California’s great mountain waterways. It is particularly notable to anglers for its native trout that are endemic to the river. However, while the fishing on the McCloud is great, the river is probably most famous for its trio of awesome waterfalls. Each waterfall exhibits volcanic geologic features. Though the falls are obvious highlights, the entire length of the river is quite scenic. 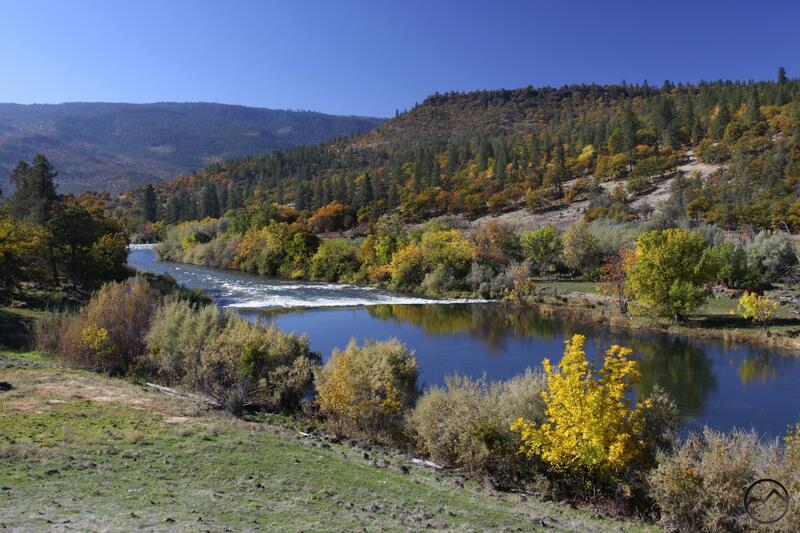 It is possible to explore it via the McCloud River Trail, which runs parallel to the river for 15 miles. To the north of Mount Shasta, the Cascade Crest is clearly distinguishable. Formed of a line of tall, volcanic peaks, the crest begins at Ash Creek Butte and runs north all the way to the Klamath River at the Oregon border. Notable peaks aside from Ash Creek Butte are the Whaleback, the Goosenest and Willow Creek Mountain. All are extinct volcanoes. While this area boasts awesome scenery, it has very few developed trails. The best are found on the Goosenest and at little-used Orr Lake, which lies on the dry, east side of the crest. Despite the lack of developed recreational opportunities, this area has much to offer those who are prepared to hunt for them. The most notable is the mysterious Hole In The Ground Geologic Area. The hole is actually the remnants of an unusual volcanic eruption. While its nature is not entirely understood, it is a fascinating and beautiful reminder of the region’s violent past. Beyond Willow Creek Mountain, the California Cascades subside down toward the mighty Klamath River. While solitary Secret Springs Mountain boasts an impressive crater, there are few volcanic peaks along the river. Instead, the Klamath passes through a deep canyon, which is occasionally punctuated by large, rocky outcroppings. Like the Pit River, the Klamath River makes a complete bisection of the Cascade Range. The river’s headwaters are deep in central Oregon, where the Sprague and Williamson Rivers drain large, volcanic uplands on the east side of the Cascades. These rivers combine and then flow into Upper Klamath Lake. 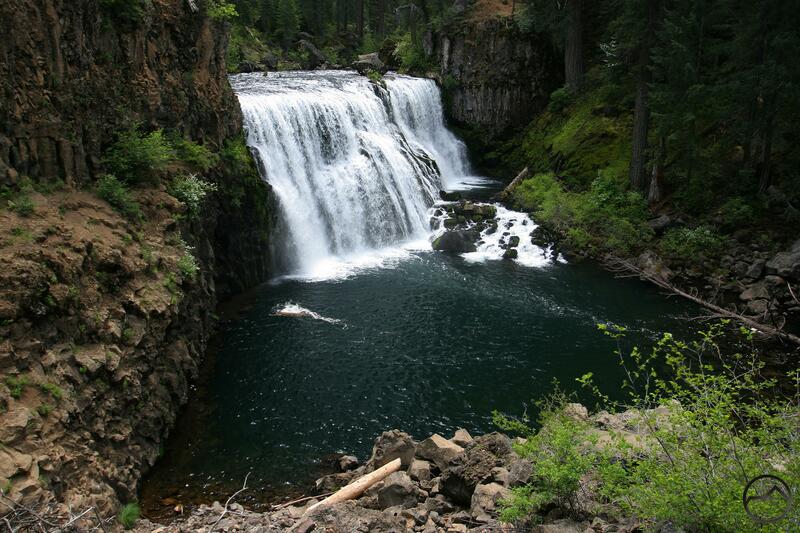 The Klamath River begins at the outlet of the lake and promptly begins its passage through the Cascades. While the canyon is spectacular, very little of it is open to the public due to hydroelectric activity. The river canyon to the east of Copco can be accessed via a good dirt road and there are public access points along the river for fishing. Short walks are also possible here. A primitive BLM campground is located right on the state line, for those motivated to explore this exceptional place. Beyond the Klamath River, the Cascades enter Oregon, a state well known for dramatic volcanoes and other volcanic features. While the Oregon section of the range is initially composed of gentle, rolling fills with vast forests, it quickly begins to thrust upward again. 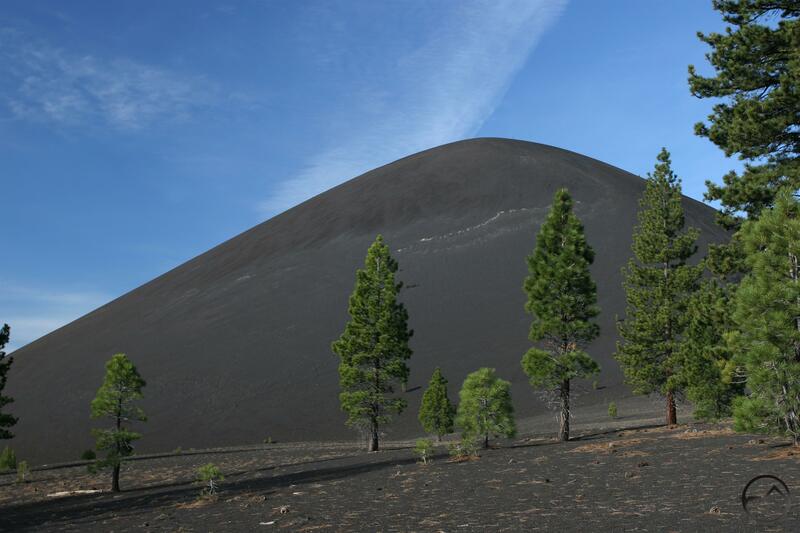 One of the first notable features is tall Brown Mountain and its dark lava flows. 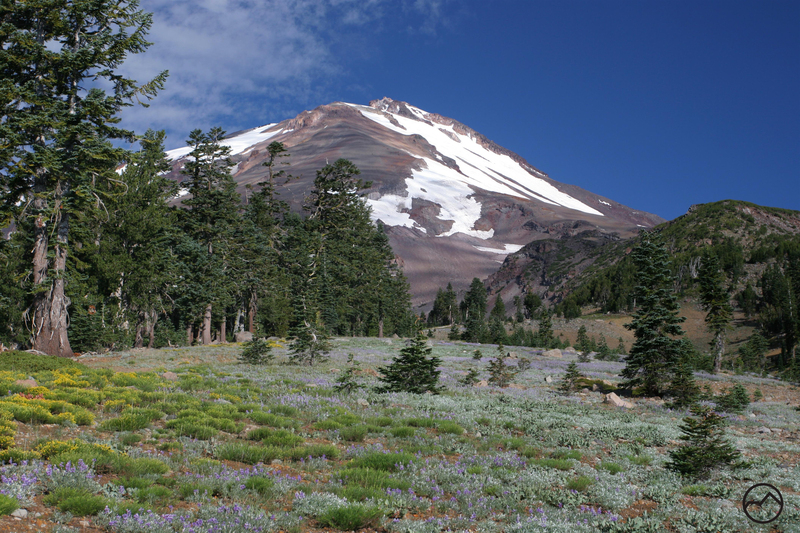 A little further north is towering Mount McLoughlin, the highest peak in southern Oregon. While it is nowhere near as tall or as large as Mount Shasta, Mount McLoughlin is an awesome mountain. The peak is prominently visible from many places in the California Cascades and it presides beautifully over the area immediately around it. The peak anchors the southern end of the Sky Lakes Wilderness, which is the first in a long string of semi-contiguous blocks of wilderness areas that stretch north along the spine of Oregon toward Mount Hood and beyond, into Washington.